Whether a fiduciary relationship existed at the time of the alleged corporate misconduct. Whether the breach of fiduciary duty and/or corporate misconduct arose within the scope of the relationship. 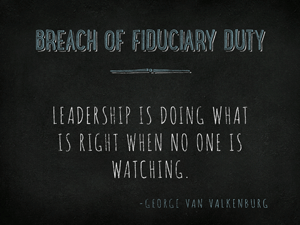 Addressing these common breach of fiduciary duty issues is only the beginning of the legal analysis. Although there is no universally accepted definition of when a fiduciary relationship arises in a corporate or business context, indications of such a relationship would include the following: the acting of one person for another; the having and the exercising of influence over one person by another; the placement of confidence in one person by another; the dominance of one person by another; the inequality between the parties; and the dependence of one person on another. In addition, the courts have considered weakness of age, mental strength, business intelligence, knowledge of the facts involved or other conditions giving to one an advantage over the other. In summary, whenever one party places trust and confidence in a second person with that second person's knowledge, specifically in the business or corporate context, it is very possible that a fiduciary relationship is established. When the fiduciary relationship is established, either under statute or in a contractual context, the idea is to impose on the fiduciary the duty to act in the best interest of the trusting party. Self Dealing (i.e., through conflict of interest business transactions or reaping of personal gain or personal economic profits). Usurpation of business or corporate opportunity. Misappropriation of corporate funds or corporate property. Corporate neglect, business imprudence, of lack of necessary business skill and experience. Failure to act in the business owners’, shareholders’, or members’ best interest. Misrepresentation or omission as to a statement of fact (e.g., corporate financial conditions or business statement of affairs). Breach of corporate fiduciary duty (e.g., to provide accurate corporate information). Misuse of confidential information or breach of confidentiality. Corporate aiding and abetting or acting in concert with another. Rendering inappropriate advice or counsel (e.g., bad business ore corporate investment advice). Misuse of superior or influential position.